Moog Music Forum • View topic - Midi Preset Box? Hi, I posted something similar on the Moogerfooger forum, but this may be a better place. I have a pedal that sends Midi Program Changes, but does not send CCs. Is there some type of hardware device that can store Midi CC Commands and be triggered by program changes? Just a small preset manager. Maybe with a little display to show the preset or bank number. If these are out there, what would the name of this thing be? I've been searching nonstop for over 5 hours and can't find anything remotely like this. If you already by chance own an iPad, you could add a MIDI interface to it, and use an app such as "MIDI Designer" (HIGHLY recommended!!) to pretty much build whatever kind of MIDI control you need! 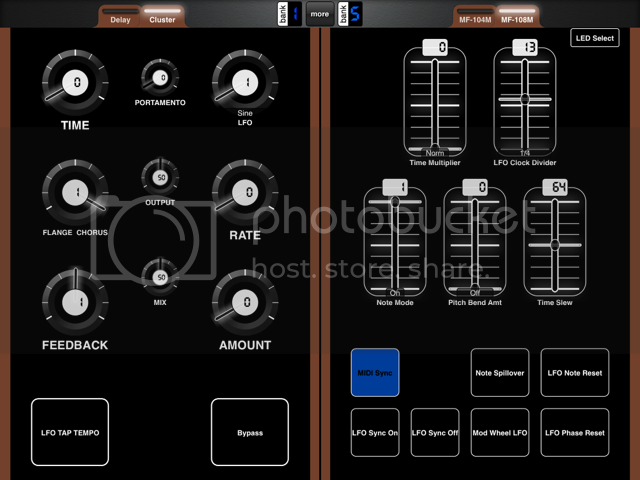 MIDI designer has a feature called "pedal boards", which basically allows any input you designate from an external MIDI controller to active any other MIDI control(s) you want on your customized MIDI control app. VERY cool - and if you already have an iPad, probably the most affordable and versatile solution! Thanks Randy. I do have an iPad and an Alesis iodock. I was recommended TouchOSC, Lemur and MIDI Designer. It seems like it may just come down to personal preference on these. I'll use MIDI Designer Lite to see how close it gets me. I do wish the interface didn't look like something from Windows 98, but that's really non-issue because all that matters is functionality. No restrictions like you might run into with the Lite version. AFAIK, all the features work exactly the same as the Pro version, just fewer simultaneous controls. Oh, I'll definitely purchase if it works out! I made a mockup of the MF-104M and it seems really easy and straightforward. Yeah, I found that once you get your head around the basics, MIDI Designer is actually quite easy to use, but capable of being used as the basis for some powerful MIDI controllers! I personlly really like the fact that all editing takes place right on the iOS device - no PC required. I'm also using an Alesis iO Dock for my iPad(2), and really like the integration with my home studio. The current (30-pin only) iO Dock does NOT support SYSEX commands. You may not need that type of function for a while - for our purposes, SYSEX is mainly used for firmware, bank & patch management on MIDI hardware that doesn't have a dedicated software editor, or as "behind the scenes" commands by the editors themselves. 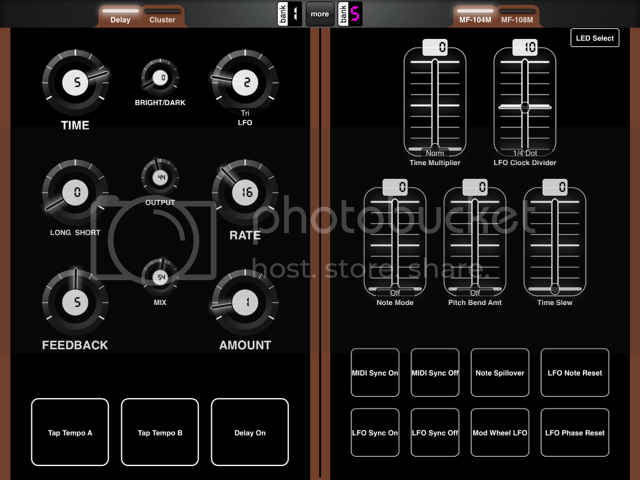 The iPad itself certainly supports SYSEX, and many apps - MIDI Designer included - have SYSEX managment and command capability. Long story short - if you wind up needing SYSEX support, you'll need to do that with a separate iOS MIDI interface, and not the iO Dock. That may very well be something you may never need to be concerned with, and far as the Moog gear is concerned, you can handle just about everything you'll need with MIDI CC commands - which the iO Dock definitely supports - or dedicated computer-based editors. Apps like MIDI Designer will let make snapshot presets of all your control settings, so in essence it can still provide preset librarian functions. Keep us posed on your efforts! MIDI Designer definitely gives me all the functionality to control every setting. It was really easy to setup after getting the hang of midi. I used a preset on the website and customized it. I haven't connected the pedalboard yet, but it seems simple enough. The biggest problem I'm running into is that the foogers don't always accept all of the settings when a preset is pressed. Sometimes they do. Sometimes only one thing changes. Sometimes only one thing doesn't change. I don't know if this is the app, the interface or the Moogerfoogers. I also can't get the toggle switches to work. I believe I have them set correctly. I can get momentary switches to work, but since I need the setting to be saved, it has to be toggle. I've worked around this by just using knobs instead. 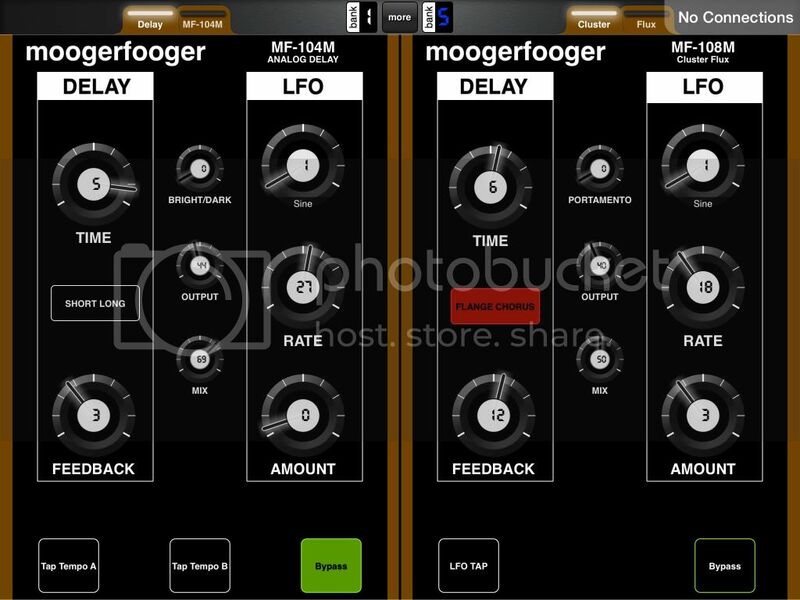 If you're willing to share, you should post this over in the MoogerFooger forum! I have a 104M, but haven't done much with the MIDI implementation yet. If you're up for it, I wouldn't mind tinkering with the layout you made and trying to help work through some of the issues you're having. GREAT job finding & modifying that one! Thanks! I took it a step further and added some more Moogness. I'm just working out a few things, but I'll absolutely post them up for download as soon as I know its good to go! I've been busy creating presets for all the settings I've ever used on them. I want to add the Midi Murf as well as a Midi to CV page for the rest of the foogers. Once it's all up and running I'll get it posted. I'd love to shoot them over to you via email if you'd like to verify it's working good. Now, if I can just get Dan to allow us to export presets. I'd like to share them like the guys with the Strymon pedals do. The ability to share presets, and not just the entire template, would be a nice addition! facon wrote: MIDI Designer definitely gives me all the functionality to control every setting. It was really easy to setup after getting the hang of midi. I used a preset on the website and customized it. I haven't connected the pedalboard yet, but it seems simple enough.